Nicole Scherzinger stars in a new ad for Müller, showcasing the new Müller Quark Yogurt, which is described as a “traditionally thick alpine style quark mixed with creamy Müller yogurt”. The 30-second spot, set against a stunning landscape, features the American singer/actress saying that the secret alpine village she is in is the inspiration behind the new Müller Quark Yogurt. “High in protein, traditionally thick alpine style quark mixed with creamy Müller yogurt. It’s so creamy. And it’s really thick!” Nicole says, while holding a spoon full of Müller Quark Yogurt upside down. 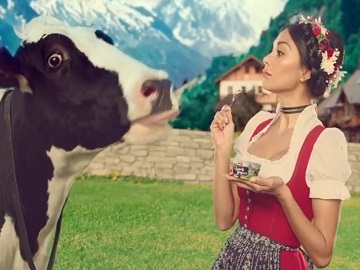 At the end of the spot, she is approached by a cow that says the brand’s famous catchphrase, “Müllerlicious”. Delighted to hear it from her four-legged “friend,” Nicole can’t help but agree: “Yes, baby, yes!” she adds with a large smile on her phase. The advert also highlights that the new Müller Quark Yogurt is made with 100% naturally sourced ingredients and that Müller is the Official Yogurt of British Athletics. Nicole Scherzinger, who is a Müller brand ambassador since 2012, has also promoted, over the years, the brand’s Spreadable Butter, the Müller Corner Plain, a natural, unsweetened Greek-style yogurt with a delicious strawberry and goji berry compote, the White Velvet range of yogurt, and the brand’s Limited Edition Corner yogurt.